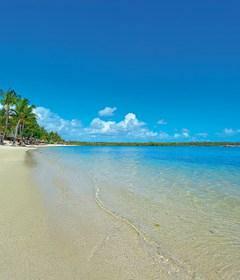 Constance Le prince Maurice sits along the north-east coast of Mauritius, just south of the Bras D'Eau National Park. This lovely luxury resort is reminiscent of something one might find in Tahiti or Hawaii. Cosy suites built on stilts over the water provide a romantic and intimate getaway for couples while the resort's main building is warm and welcoming with its perfect use of open space and native wood. 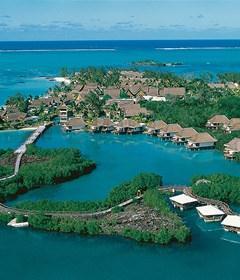 Constance Le prince Maurice offers just the right balance between luxury and peaceful relaxation. 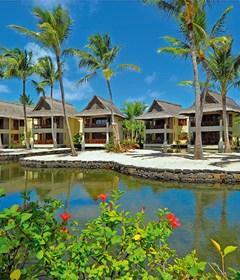 The resort features 64 Junior Suites, 12 Family Suites, 12 Villas, and the lavish Princely Suite. Each of the suites has been uniquely designed using the principles of feng shui to create harmony among all aspects of the interior space. Modern furnishings combine with just the right colours and arrangements to create an environment of total relaxation. The Junior Suites are elegantly decorated to present guests with a sense of intimacy. Some of the suites are built on stilts with direct access to the water. Family suites provide the same level of relaxation but with larger spaces and amenities for families. Villas provide even more space at 130-m² – nine of the villas offer private pools and direct beach access while the other three overlook the resort's natural fish reserve. The Princely Suite is 350-m² of private space in a secluded portion of the property's beach. The Suite is comprised of two Junior Suites and one Villa all joined. Extra amenities include two private, heated pools and three individual terraces, each with its own view. •L'Archipel –The resort's main building is home to the 140-seat L'Archipel restaurant. Open for breakfast, lunch and dinner, guests can choose from a menu consisting of Mauritian-influenced gourmet food, light snacks, and à la carte options. The restaurant also serves delicious themed buffets for dinner. Choose a seat overlooking the beach or the pool area. •Le Barachois – Le Barachois is a smaller, more intimate restaurant open only for dinner. It is a floating restaurant with five separate decks located in the midst of the resort's fish reserve, accessible only by a wooded path leading to the main entrance. At Le Barachois, you will enjoy exquisite seafood and quite a view. •Asian Restaurant – Constance Le prince Maurice features an Asian restaurant in the Laguna bar area. It offers a full selection of Asian specialities, including sushi and sashimi, for dinner and lunch only. 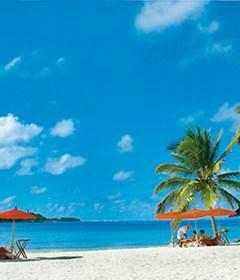 •Bars – Constance Le prince Maurice offers four different bars and lounges for your enjoyment. The Laguna is open from 9am to midnight; the Lotus Lounge and Barachois floating bar are both open from 6.30pm until 11.30pm; the Wine Cellar, located next to L'Archipel, offers wine tastings for parties of up to 10 people.